In the present study a mathematical model of the equatorial water waves propagating mainly in one direction with the effect of Earth’s rotation is derived by the formal asymptotic procedures in the equatorial zone. Such a model equation is analogous to the Camassa–Holm approximation of the two-dimensional incompressible and irrotational Euler equations and has a formal bi-Hamiltonian structure. Its solution corresponding to physically relevant initial perturbations is more accurate on a much longer time scale. It is shown that the deviation of the free surface can be determined by the horizontal velocity at a certain depth in the second-order approximation. 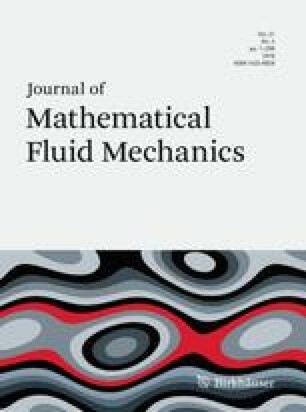 The effects of the Coriolis force caused by the Earth rotation and nonlocal higher nonlinearities on blow-up criteria and wave-breaking phenomena are also investigated. Our refined analysis is approached by applying the method of characteristics and conserved quantities to the Riccati-type differential inequality. The authors would like to thank the referees for constructive suggestions and comments. The work of Gui is supported in part by the NSF-China under the Grant Nos. 11571279, 11331005, and the Foundation FANEDD-201315. The work of Liu is supported in part by the Simons Foundation Grant-499875. The authors certify that they have no conflicts of interest concerning this work.